MANILA, Philippines – ME BOARD EXAM RESULT. The full list of topnotchers or top 10 passers in the August 2018 Mechanical Engineer (ME) and Certified Plant Mechanics (CPM) board exam is available on this page as officially released Friday, August 31 or in four (4) working days after the exam. 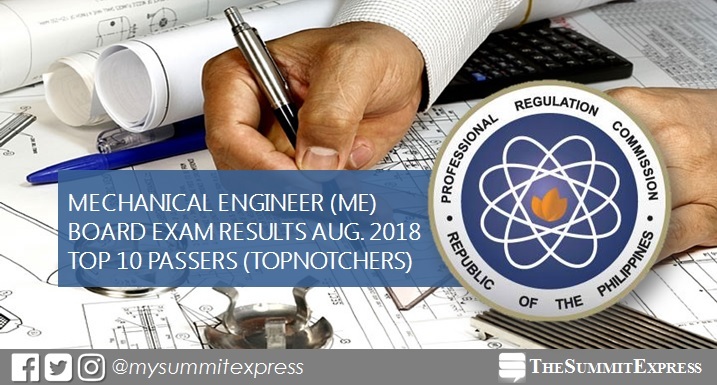 The Professional Regulation Commission (PRC) recognizes the highest placers for August 25 and 26 mechanical engineer board exam, which was conducted in various testing centers nationwide: Manila, Baguio, Cagayan De Oro, Cebu, Davao and Lucena. Fernando Murillo Remojo Jr. of Southern Luzon State University (SLSU)- Lucban topped the Mechanical Engineer board exam with 92.65%. It was followed by Alwyn Dominique Paderes Panoso of Mapua University (MU) with 92.60%. In the September 2017 mechanical engineering board exam, Jay Nelson Talip Corbita of Xavier University aced the board with 92.20%. It was followed by Von Eric Abag Damirez of University of Batangas with 90.15%. Elso Umbao Elumbaring Jr. of Notre Dame University (NDU) topped the September 2016 ME board exam with 90.15%. Edcel Reblora Fortes of Sorsogon State College - Sorsogon ranked second with 89.40%.